After Ben Lomond the previous day it was time for some more hillwalking in beautiful winter sunshine. 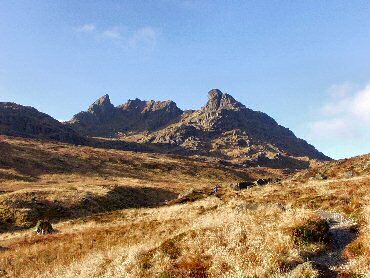 This time my destination was Ben Arthur, or "The Cobbler" as it is better known. Walking up from Succoth at Loch Long I soon reached Allt a' Bhalachain (also known as Buttermilk Burn) which I followed for a while. 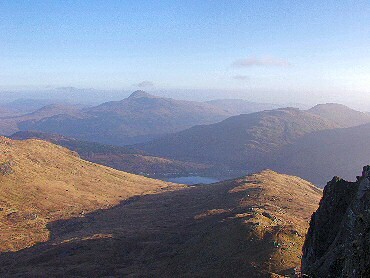 Soon the peaks of The Cobbler became visible in the distance. Past the Narnairn Boulders I continued along the path until I reached the foot of The Cobbler. Now the path (or what was left of it) got steeper, culminating in a scramble up the corrie to reach the saddle between the two summits. The real summit is on the central summit, which I visited first. The views below are all from the main summit, although the views from the northern summit are very nice as well. After a great time out on The Cobbler it was time to return to my car to drive back to Glasgow. I walked down the northern side of The Cobbler to reach the glen between Beinn Ime, The Cobbler and Beinn Narnairn. From here it was easy to return to the path along Buttermilk Burn and walk back to Loch Long. 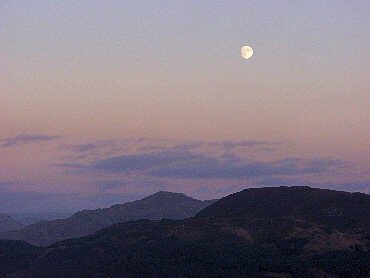 With the sun setting I had a nice view of the full moon over the hills behind Arrochar. 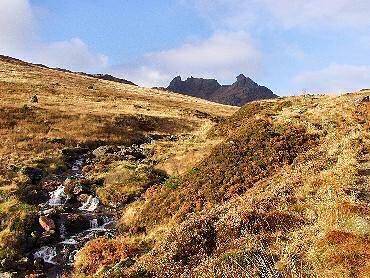 I would recommend the walk to The Cobbler to any walker. The views are great and the walk as well as the scramble up the corrie to reach the saddle between the summits isn't too difficult.